Detect impacts to service quality correlated with user, network, and application delivery. Voice over IP communications keeps your business connected with customers, and keeps employees productive. An outage or poor service levels can have an immediate and sizable impact on your business, which means that VoIP is a critical portion of your infrastructure. The causes for these disruptions can be difficult to assess and can come from a variety of sources. The ExtraHop platform provides continuous monitoring and analysis of VoIP and video traffic in real time and at scale. By utilizing ExtraHop to deliver deep wire analytics on your VoIP traffic, your IT team can quickly detect impacts to service quality correlated with user, network, and application delivery across all tiers. 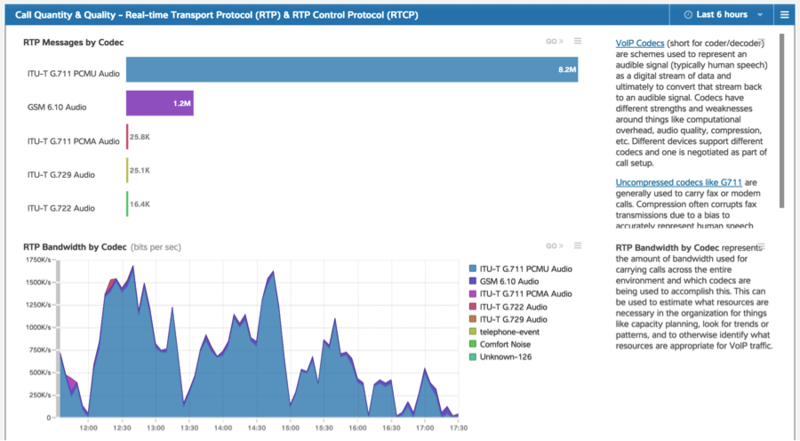 The ExtraHop platform monitors over 275 metrics across SIP, RTCP, [RTP](/resources/protocols/rtp), and RTCP XR protocols. In addition, the ExtraHop platform natively supports DSCP analysis. When combined with ExtraHop's VoIP analytics capabilities, you gain insight into Quality of Service (QoS) tags and validation that device packets are properly tagged for prioritization. ExtraHop's customizable VoIP dashboards deliver the metrics you need to keep your VoIP solution operating and performing. Download this PDF to see more examples. Voice was ranked as the second-most used communication method (86%, behind email at 93%) for employees. 68% of consumers would hang up as a result of poor call quality and call a competitor instead. Packet capture is the most relied upon troubleshooting method for VoIP issues.